Does it get any better than waking up every morning, strolling out to your own personal balcony and drinking in, along with your morning coffee, awe-inspiring views of the majestic Atlantic Ocean? It does if your home is in North Beach Towers, the centerpiece of North Beach Plantation, a 60-acre master-planned community conveniently located at the southern tip of North Myrtle Beach, South Carolina. A luxury oceanfront condominium overlooking the Carolina shore is only part of the story. The rest of this tale of two 18-story towers includes a Carib-bean-themed recreational area below, nearly three acres of pools, personal cabanas, a swim-up bar, fountains and a lazy river; an 18,000-square-foot, world-class spa and fitness center; and top-of-the-line restaurants in the third-floor and 14th-floor bridges that connect the towers. North Beach Plantation offers other interesting residential options in addition to North Beach Towers. The Villas at North Beach are three-bedroom condos homes in a five-level building, while single-family homes are available in the Margaret and Appleton neighborhoods. The Exchange will feature condos above shopping, dining and office space. North Beach Plantation offers all this and a location in the heart of the Grand Strand, an alluring strip of the Carolina coast where shopping, dining, the beach, golf and just plain fun are never far away. Nearby, Barefoot Landing, Broadway at the Beach and Coastal Grand Mall offer a wide array of shopping opportunities, from outlet stores to North Beach Plantation Myrtle Beach, South Carolina surf shops to boutiques. There also are hundreds of art galleries, antique dealers and other independent retail establishments within hailing distance of North Beach Plantation. It would be nearly impossible to visit every restaurant on the Grand Strand, but, if you choose to do nothing else, you might give it a try. The area is famous for its seafood, of course, but other enticing options include Italian, Thai, German or even a dinner theater. After dinner, dancing, amusement parks, miniature golf and other activities await. The Grand Strand is the golf capital of the world, but it's not the only sport in town. Tennis, sailing, skiing, kayaking, surfing, minor league baseball and deep-sea fishing all are popular pastimes. Simply hanging out at a condo in North Beach Towers is also an interesting way to spend a day. The magnificent ocean views are standard with each condo, but home buyers also have a choice of eight separate floor plans, from the one-bedroom, 953-square-foot Southport to the five-bedroom, 3,169-square-foot Georgetown. All offer huge balconies; covered parking; wired and wireless options for television, telephones and the Internet; 9-foot ceilings; crown molding in the entry and tray ceilings in the dining area; designer tile in the entry, hall, kitchen and bathrooms; private storage rooms; and high-speed elevators. The gourmet kitchens come with granite countertops, custom cabinetry and stainless steel appliances, while in the bathrooms, classic cabinetry, granite countertops, whirlpool tubs and separate tiled showers are the norm. All bedrooms and the living area feature the finest carpet and are pre-wired for ceiling fans, and the master bedrooms have huge walk-in closets. Many of these same features are offered at the Villas at North Beach. Does it get any better? 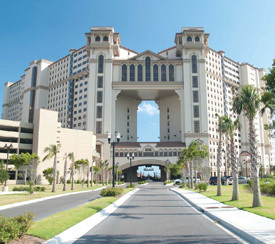 For More Information go to www.CoastalCondoLiving.com/NorthBeachPlantation or www.OceanfrontCondominiums.com/Myrtle-Beach-Condos.